This is the most annoying piece of advice you hear ALL THE TIME when living in China. My friend smashed her elbow, the bone, and went to the hospital. Their recommendation? Drink hot water. Citation: Becky, please forgive us for having found your post about what happened when you came down with a “major disgusting, hocking, snotty nose, bleary-eyed” case of flu in your adopted home of China highly amusing. That is actually a compliment, coming from us! We also think, moreover, that you may have overreacted slightly to being told repeatedly by Chinese students and friends to drink hot water. 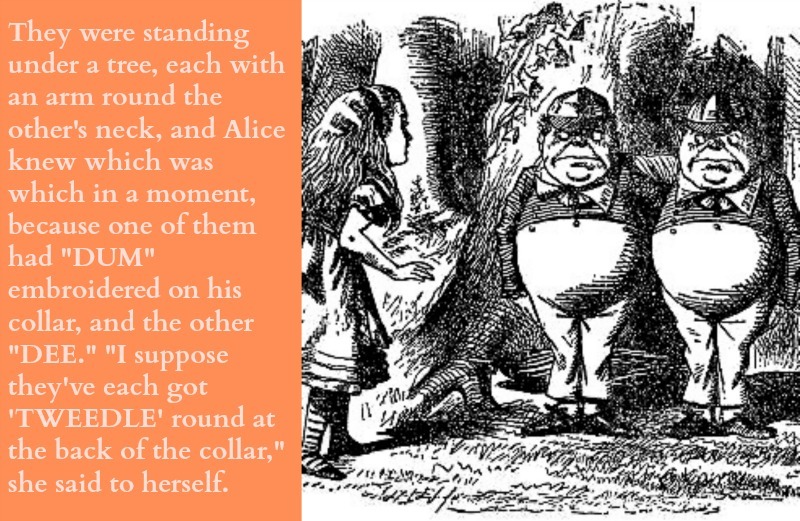 We refer you to the “Queen Alice” chapter in Through the Looking Glass, specifically the section where Alice, having found herself wearing a golden crown, arrives at a party being held in her honor. She is surprised to be serenaded by a solo singer with a shrill voice pretending to be her stand-in. 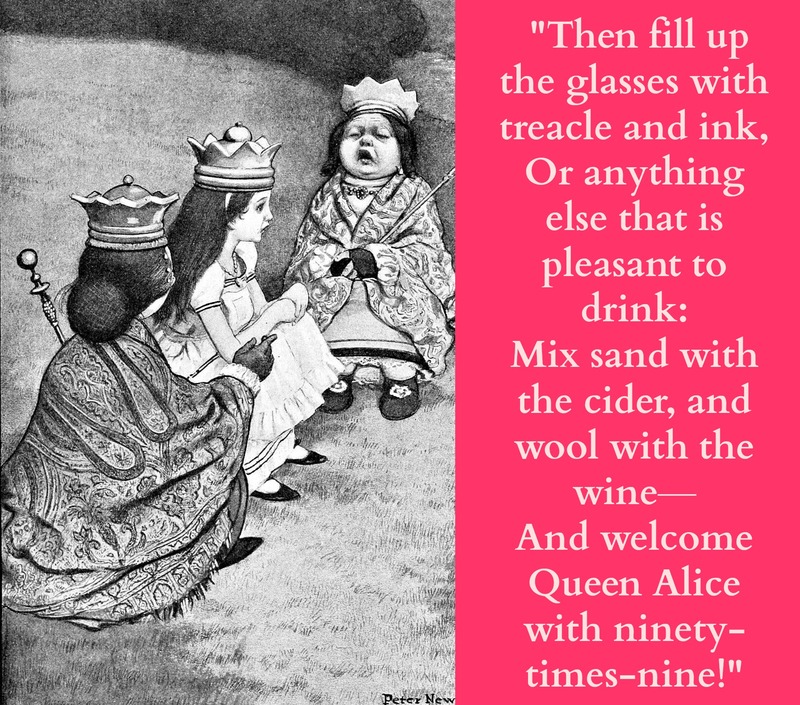 She is even more surprised when the hundreds of looking-glass creatures (animals, birds, even a few flowers) who are attending as guests join in a refrain that proposes concocting drinks full of cats and mice, treacle and ink, etc., for a special toast. Looping back to your situation in China: Be grateful it was only hot water they were prescribing (besides, isn’t hot water safer to drink in China?). Under other circumstances, your Chinese friends might have been foisting snake wine or other therapeutic drinks on you as curatives. You are absolutely right, however, to avoid people who sneeze and don’t cover their mouths. And we hope you are also sensible enough to know that if someone offers you a bottle labeled 我喝 to pour the contents into a flower pot when no one’s looking. (The flowers will thank you for it!) Get well soon, Becky. We wish to read more of your posts! It is from this frequent changing of worlds and communities that the two main challenges of growing up global form. The question of identity: Which of my many selves am I? and the matter of unresolved grief. With so many cycles of transition, if people don’t process the inevitable losses as they happen, the grief that is inherent in losing things that we love will have to go somewhere deep inside. 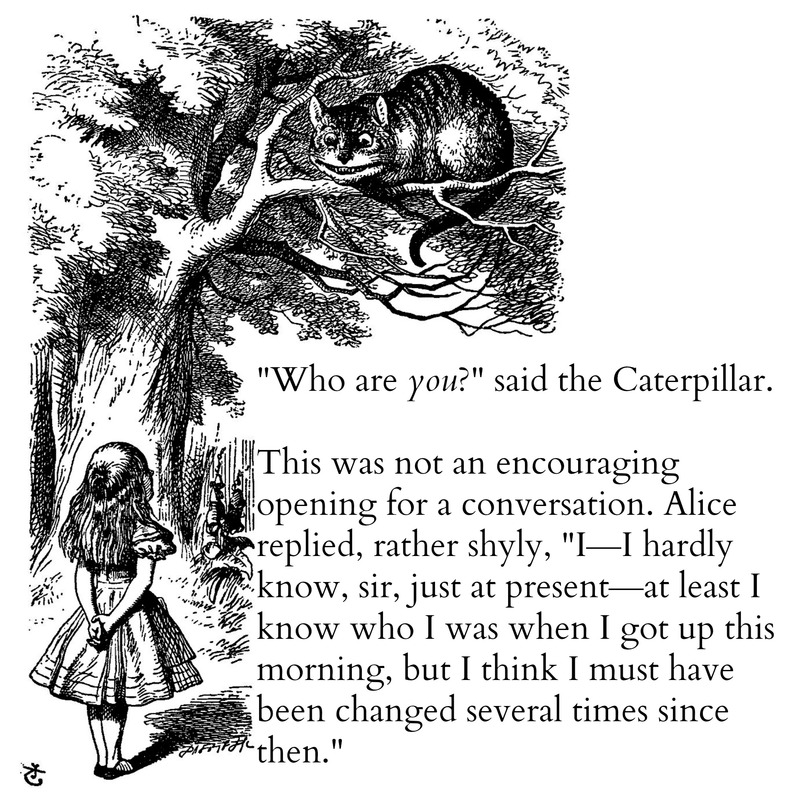 Citation: Ruth, reading about your struggle to embrace your multiple identities and channel your grief at saying so many goodbyes at a young age—well, let’s say it makes Alice’s confession of an identity crisis to the Cheshire Cat seem a bit of a cake walk. Alice presumably had only one other self, that of a well-behaved Victorian girl, to reconcile with the adventuresome spirit she’d become in Wonderland. You by contrast have had to deal with multiple selves after spending your first 13 years in Nigeria with your missionary parents. We must say, it was brilliant of you to use journaling as your Cheshire Cat when you found yourself, in your late thirties, suffering from a depression about these unresolved emotions. Translating feelings of loss, grief and confusion into the written word has clearly been a tonic. It has left you with a grin about your cross-cultural life, which you’ve generously shared with others through your memoir and other writings. Kudos, Ruth, and thank you. For her interview: “I Heart My City: Hannah’s Phnom Penh,” in Beyond the Guidebook, a feature of NationalGeographic.com’s Intelligent Travel section. The most random thing about my city is the quantity of people going about their workdays dressed in matching, printed pajamas. Citation: Hannah, our first concern, after reading your engrossing interview post, is whether there’s a way to tell “dee” from “dum” when you see two people wearing identical pajamas—and if not, would they consider embroidering their names on their collars? Also, the concept of wearing pajamas during the workday sounds most unusual to those of us who know Japan, where pajama costumes might be worn to the hot springs bath but certainly not to work. Finally, we are curious about the print on the pajamas. Most uniforms we’ve seen, including those for Tweedle Dum and Tweedle Dee, don’t involve prints (apart, that is, from the stripes on their caps). We hope for your sake that the print is subtle rather than garish. Otherwise, there might be too much “ditto”, as Tweedledum might say, or “ditto ditto” as Tweedle Dee would respond. To sum up, Hannah, your interview has left us curiouser and curiouser. Well done! Oh my! So much to read – so little time. (I sound like Alice.) Thanks for always coming up with these interesting people. Congrats to the recipients! Nice to see Becky Ances included, I’ve followed her blog for some time and even had the pleasure of meeting her here in China. She has a unique perspective on the world. 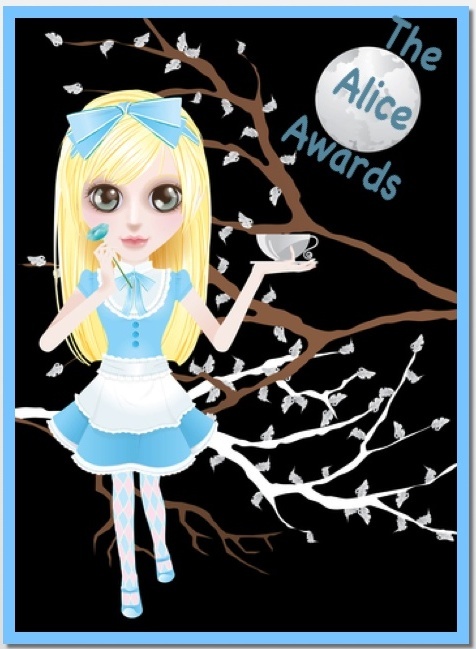 Thanks so much again for not only reading but this Alice award. Wow.